Contamination levels were often high enough to make people and animals sick, according to researchers at the University of California, Santa Cruz. Their findings revealed that contamination levels "greatly exceeded" regulatory guidelines for multiple toxins in 2012, 2014, and 2015. "This is the first time we've found all four of those toxins, including both freshwater and marine toxins, in the same mussel samples," says lead author and ocean scientist Raphael Kudela. "A big concern is that we don't know what happens if someone is exposed to multiple toxins at the same time." San Francisco Bay, where freshwwater and marine waters converge, acts as a "big mixing bowl" where toxins collect, according to the report. Consuming algal toxins — toxic substances released by certain algae — can have detrimental health effects in people and animals. In humans, it can produce allergic reactions such as skin rashes, respiratory symptoms, gastroenteritis, even liver and kidney failure or death, according to the Environmental Protection Agency. 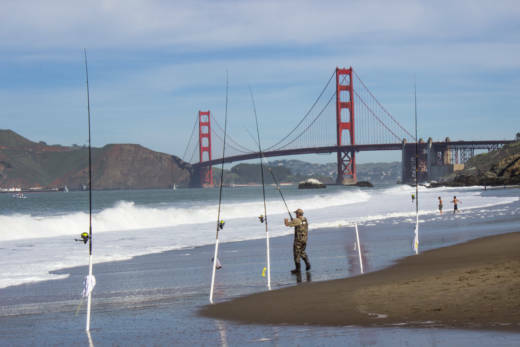 Although there are no commercial shellfish operations in San Francisco Bay, individuals harvest shellfish for their own consumption, according to the report. Online blogs feature some of the best locations along the bay to collect shellfish, including places where researchers say they found the highest toxin levels. "I don't know how widespread it is, but I wouldn't recommend harvesting shellfish from the bay,” warns Kudela, "even if you're following the state quarantine guidelines, because the state only monitors the open coast." Researchers began tracking algal toxin levels in 2011 using water quality surveys issued by the U.S. Geological Survey. Initially, they looked for two kinds of algal toxins: domoic acid and microcystins. When they found both, researchers began testing mussels for other contaminants and found that they not only contained the first two substances, but two additional kinds of algal toxins — paralytic shellfish and dinophysis shellfish toxins. Moreover, mussel samples often exceeded recommended guidelines for human consumption for both microcystins and Dinophysis shellfish toxins. The EPA lists microcystins as a possible human carcinogen. Levels of domoic acid and paralytic shellfish toxins were lower than the regulatory limits, but some studies suggest repeated exposure to even low levels of these toxins may cause neurological disorders. The study says ocean warming and the recent drought may have contributed to the situation. "Drought potentially brought some of the marine toxins further into the bay because there was less river flow, and it probably intensified the freshwater toxins," Kudela says. "We don't think the toxins were only there because of the drought, but it could have amplified things." Local and federal agencies have begun to review their monitoring programs as a result of the findings. But in areas like San Francisco Bay it can be difficult to determine who is responsible for monitoring the waters. "We need to look at coastal areas more holistically,” says Kudela, "so we don't end up with a regulatory gray area where nobody's monitoring the shellfish but people are still eating them."